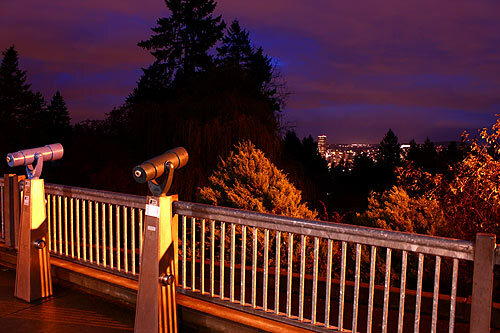 (Portland, Oregon) – If you think the reality of a visit to Portland is to check it out during spring or summer, then you need a shift in reality. Or perhaps better stated: you need to witness the more surreal side of the state. 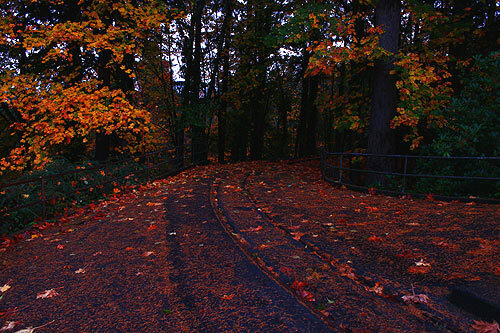 It's no secret that fall colors are insanely engaging in Oregon. But winter conditions, even at their dreariest, can make for some heady aesthetic pleasures. On a distinctly winter-like day in early November, two Portland hotspots literally became like another world, another reailty, at times. 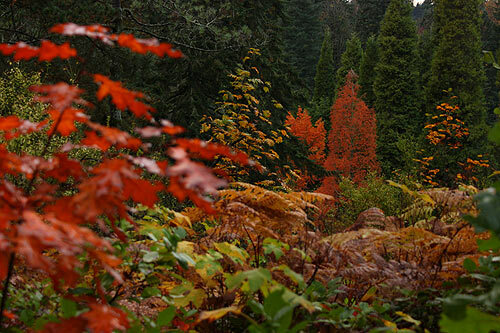 First, there is the Hoyt Arboretum, some 21 miles of trails and a massive collection of 1,000 species of trees from all over the world. As you drive along the winding road that follows the trails and meets the trailheads, you can glimpse these magnificent specimens in a colorful full throttle, a kind of autumnal overdrive, really. Stark oranges or yellows burst into sight periodically, then passing behind thick layers of fir trees and other rainforest kinds of giants and out of sight. Periodically, you can see down these canyons, and vast, lush green areas become visible between the stands of trees. Then you come to the Rose Garden. It’s getting dark, and even a little foreboding. But even a dreary day can yield wild surprises as it meets its end. A ways after sunset, the sky decides to get especially dreamlike. It’s like alternate reality here, between the unusual cast from the lights of a restroom building on the rails and pay telescopes, and the strange colors that erupt overhead. About the only thing keeping you grounded in the present is the distant cityscape of Portland’s downtown and east side as it slowly lights up for the evening. But even it could be an alternate universe, another Portland, under these skies (see the photo at the top of this page). 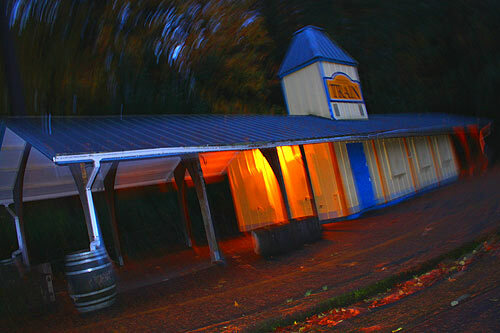 This building is a stop along the Washington Park Run steam train, which operates daily through the summer months. 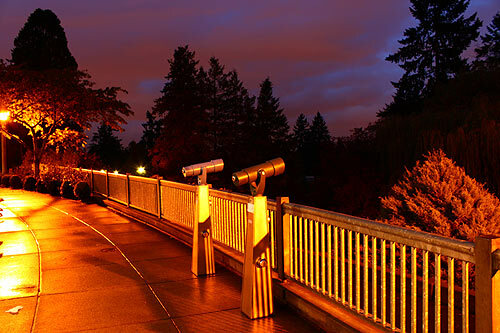 During this high season, it’s flooded with the throngs of tourists and their kids, who take the four-mile round trip from the Rose Garden, through the lush, summery forests, to the Oregon Zoo, and then back. Now, it sits unused, increasingly alone as the winter months pile up. 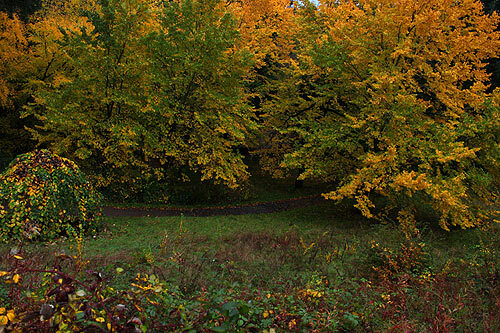 The denser and denser carpet of leaves is its only company, except for a few hikers trudging through the area. Beneath the rail sits a tiny tunnel, allowing passengers-to-be to scale up the hill from the Rose Garden’s parking lot to the little train station. 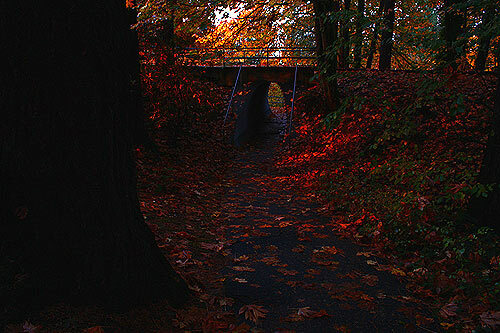 Now, this path is cloaked in heavy layers of reds, oranges and yellows, as autumn discards that which it no longer uses and dumps them everywhere. There’s something almost magical and mystical about this spot now, in a medieval fairy tale kind of way. The colors are beautiful but in an unreal way, so much so that they have a kind of seductiveness that feels slightly sinister. It’s too beautiful to be true. You’re not sure if something lovely or hideous is waiting behind that bend. 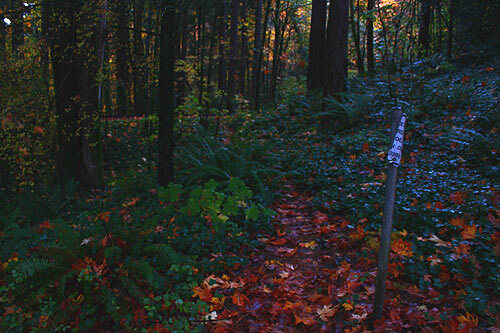 Another path appears to lead off towards into the forest, and it too is covered in these mystical, mythical kinds of colors. Again, their beauty coaxes you, and in this waning light of an already dark, November day, their intensity is alarming. You look into this multi-colored forest where it’s asking you to go, but your imagination wants to take flight and starts thinking about more creatures that could possibly lurk in there.